New plans for a £107m development in Aberdeen city centre have been unveiled by developers. 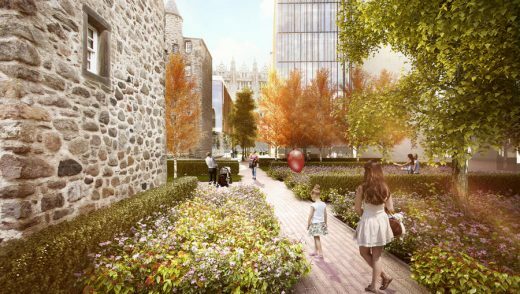 The designs will replace the former council headquarters at St Nicholas House with an office, hotel and retail complex known as Marischal Square. The vote – which ended up 23-20 – was a close affair, with the ruling Labour, Conservative and Independent coalition voting in favour of the plan, while the SNP and Liberal Democrats were against it. The current Muse proposal is for a development comprising linked buildings, the tallest of which will be 10 storeys from the level at Flourmill Lane, compared to St Nicholas House which is 15 storeys from that elevation. “The future setting of Provost Skene’s House and the inte raction between the new development and the surrounding liste d buildings is recognised as offering a number of opportunities to bot h the Council and the project. The demolition contract is currently on site with contract or Safedem. The contract is behind schedule due to elements outwith t he contractors control (utility providers). It is currently envisaged that this time can be recovered to allow contract completion in late March 2015”. Members of Aberdeen City Council’s Finance and Resources Committee are to consider a confidential report which gives an update on the sale process of St Nicholas House, when they meet on Thursday, 4 October. Twelve bids have been made by local, regional and national property developers and are all for ambitious mixed-use schemes including hotel, office, retail and restaurant/café use which would help drive the regeneration of the city centre. A range of exciting proposals has been put forward for the future use of Aberdeen City Council’s former headquarters, St Nicholas House, report Aberdeen City Council. Thirteen bids for the site have been made by local, regional and national property developers. Councillors instructed that the St Nicholas House building, which was erected in 1968 and housed the local authority until 2011, be redeveloped to pave the way for the regeneration of the east end of the city centre, bringing significant economic and environmental benefits. Provost Skene’s House, one of the oldest buildings in Aberdeen, is enclosed by the prime development site and will form the centrepiece of any redevelopment. The proposals for the St Nicholas House site need to show respect to this sadly overshadowed hsitroic building. The 0.92 hectare brownfield site is considered to be suitable for a mix of uses, including hotel, office, residential, retail and leisure. The Bon Accord Quarter Masterplan gives developers guidance about proposals which would be acceptable for the site. Councillors, in recognition of the importance of the St Nicholas House site to the future of the city centre, instructed officers to explore the options open to the council to ensure any development of the site is of the highest quality and is sympathetic to Provost Skene’s House and Marischal College and ruled that should include consideration of the council developing the site through a joint venture and the possibility of a design competition tender exercise. The offers received are all for mixed-use schemes including hotel, office, retail and restaurant/café use and the scale of development ranges from about 180,000 sqft to 650,000 sqft with parking for 150 to 600 vehicles. All of the proposals envisage the partial pedestrianisation of Broad Street, with a number of the bids including proposals for significant spend on the public realm. Ryden has been instructed to market the St Nicholas House site on behalf of Aberdeen City Council and is carrying it out in two stages – stage one, which was completed in early July 2012, required all bidders to submit indicative designs, proposed uses and outline financial proposals. Stage two, which will follow the consideration of stage one proposals, will require fully designed and costed proposals to be submitted from a shortlist of preferred options drawn from the stage one process. These bids will now be assessed by council officers and Ryden using a ‘best value’ scoring matrix to identify a shortlist of bids to be taken forward to the next phase of the process. A report on the shortlisted bids will be considered by the Finance and Resources Committee in due course. Meantime, the soft-strip demolition of St Nicholas House has begun. Safedem was appointed to carry out the project, which is scheduled for completion at the end of 2012. Talks started in 1961 about a new council headquarters but the building work really didn’t start until 1965 according to Aberdeen City Council. Aberdeen City Councillors voted in October 2011 to demolish their former high rise headquarters – St Nicholas House.